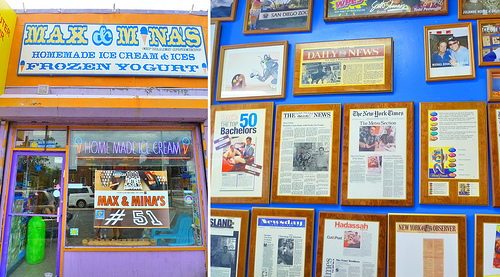 I was introduced to Max & Minas while watching Ice Cream Paradise on the Travel Channel. When they mentioned Flushing, Queens, I was like huh? what? really? but ecstatic of course. Then when I saw the storefront, I was shocked. I’ve driven by so many times over the years on my way to Baskin Robbins and their mere 31 flavors. Shame on me. I overlooked this Ice Cream gem. 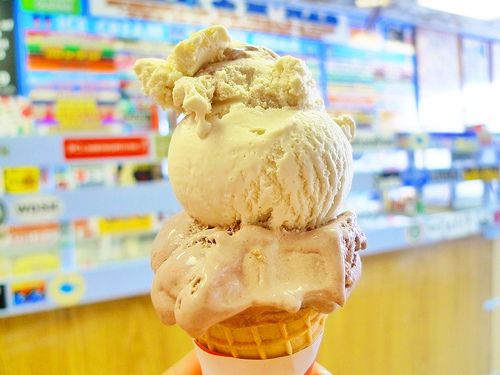 From their wall of ice cream lovers, celebrities and media adore this place. Now it was this Chubby’s turn to judge. Max & Minas has flavors that can satisfied anyone’s craving or mood. I stood there frazzled, in the sweetest and most delightful way possible… how does one choose!? I was in ice cream paradise and anything was possible. I didn’t see the lox, potato chip fudge or jalepeno flavors offered that day, but their “wine” list and beer was an afternoon “happy hour” in my book. Finally I went for BEER and MERLOT. This is 1 scoop by the way, yes they like to be generous and yes this was only $2.95. Both flavors are vanilla based, super rich and creamy. The kind of creamy that leaves your lips soft like chapstick. The beer was unmistakable, it was present and it’s absolutely genious. Beer + ice cream, it taste just like you think it would, can’t go wrong with that. I don’t like to drink beer, but I like beer ice cream, go figure. Merlot on the other hand, had a stronger vanilla ice cream taste, the wine flavor was very very light and subtle, I wished it was stronger. From the hints that I got, I think it could be a winner. Flavors I’m going back for are Champagne and Pinot Noir. Maybe one day they’ll do a Riesling or a Malbec, after all… any flavor is possible here. Along with their infinite amount of flavors (they rotate), you can also find Kosher ice cream. It sure is sweet to have a place like this in Queens. Summer is here and I predict becoming a regular or an addict even. At least, these won’t take send me to AA meetings…. maybe just Jenny Craig but that’s a whole other blog post (in the mean time, I pat my chubby back for picking a blog name that can justify). Oh my goodness I would be paralyzed with indecision in this place. I would love to try the champagne ice cream (maybe not the lox)! I had the pleasure of tasting their flavors at this year's Food Film Festival. One word – INCREDIBLE! I must go there in person and see all these diverse flavors. I got to try the spicy peanut butter (OMG!) and the chocolate chip pancake. It had bits of actual pancakes in it. DIIIVINE!! !